A beauty lies in a young person knowing who they are and what self-expression means to them, especially when it doesn’t necessarily match with mainstream ideals. An attempt to verbally explain Palberta’s music might come out as confounding as the music itself, and that, in itself, is delightful. But here goes. 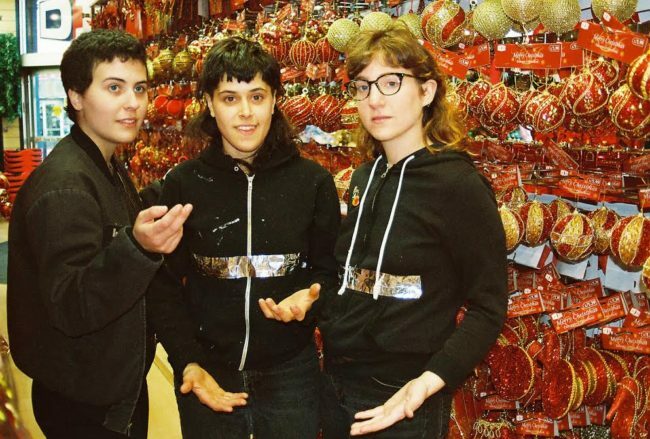 Their new single, “Ode To Honey,” off their forthcoming seventh release, Bye Bye Berta out February 10 on Wharf Cat Records, displays a continuation of their eccentric exploration of tonal and rhythmic possibilities. It starts somewhat disjointedly, minimal cymbals and an emphasis on toms giving it a tribal, satanic feel right off the bat. Jerky guitar and chant-like vocals in the background are irksome, almost, but the leads are assuring and inviting. It’s disjointed, yet danceable, though that dance might look something like a deer learning to walk. And then it changes for the ceremoniously anthemic. With more fluid guitar parts and…sleigh bells (? ), it’s suddenly at home with you. The prevalence of higher-pitched vocals take it to a cherubic level, and the rain-dance from before becomes one of celebration, as though prayers have been answered. And then it’s over. You listen back and the whole thing plays as a beautifully shot photograph of a compound fracture, a bone sticking through skin, but with really good lighting.